Calling all Sculptors, Ceramic, and 3-D Artists! 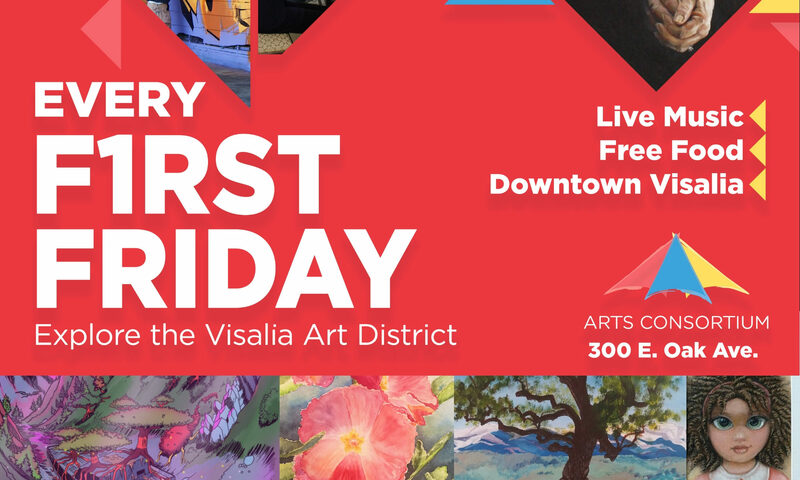 We are featuring you during July and during First Friday! The Arts Consortium would like to invite all to participate in our July 2019 “The 3rd Dimension” First Friday show, featuring sculpture, ceramics, assemblage, and any other 3-D art work. 1. Original work only, submitted by the artist or a friend of the artist. 2. 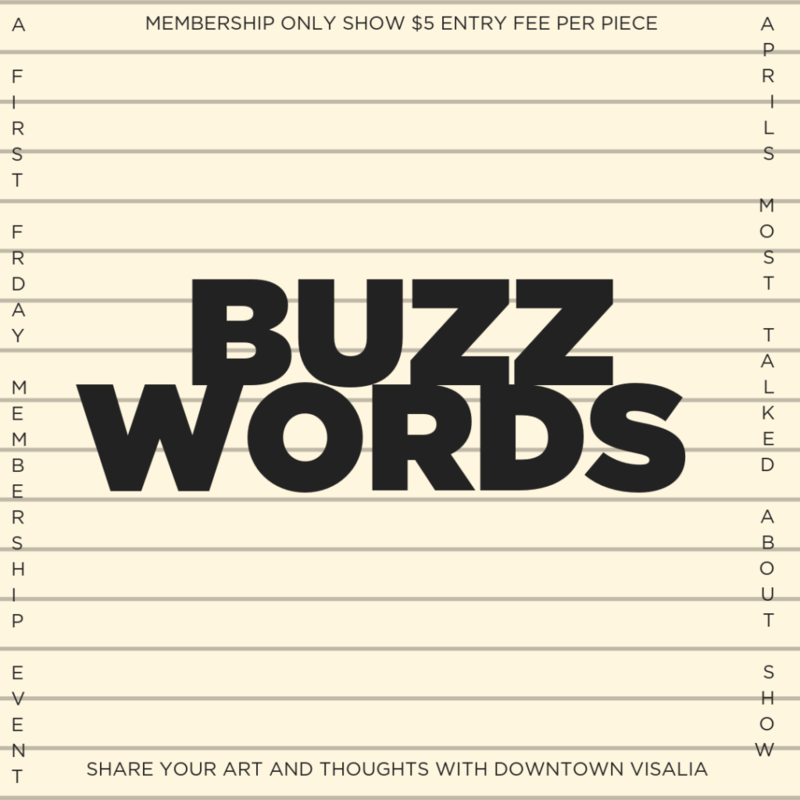 We will be asking for a $5.00 membership entry fee and a $10 entry fee for non-Arts Consortium members (per piece). If you want to become a member at take in we will waive the fee when you pay the $25.00 membership. 3. If your piece sells we will take 20% commission of the selling price. The Consortium will handle all sales. It is the artist’s responsibility to price their work to reflect the 20%. 4. The artist is expected to carry their own insurance. All work shown is at the risk of the artist. 5. Sculptural works that need to be hung should be brought in with hardware sturdy enough to hang. We have peg-board walls and use hooks to hang. We cannot hang from the ceiling. 6. Sculpture pieces, free-standing can be no larger than 5ft. tall and 4ft. wide and must be on a sturdy base that cannot be knocked over. No sharp edges or points easily broken. 7. All work must be labeled with the artist’s name and current contact information, title and price. 8. This is a juried exhibit and entries will be accepted or rejected upon entry. 9. Sold work must remain at the gallery until the end of F1rst Friday. Guest will be allowed to pick up purchased art work at 7:45 PM on July 5th or during Arts Consortium business hours. The person buying the work may pick up the piece with proof of payment. 10. All work MUST BE PICKED UP by Friday, July 26 10:00 AM – 3:00 PM (or by appointment). We do not have room for storage and will be receiving art for the next show in the following week. The Arts Consortium will generate publicity for the exhibit, and will provide invitations to the reception for the artists. Call To Artists! 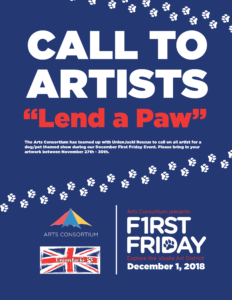 – First Friday is going to the Dogs! 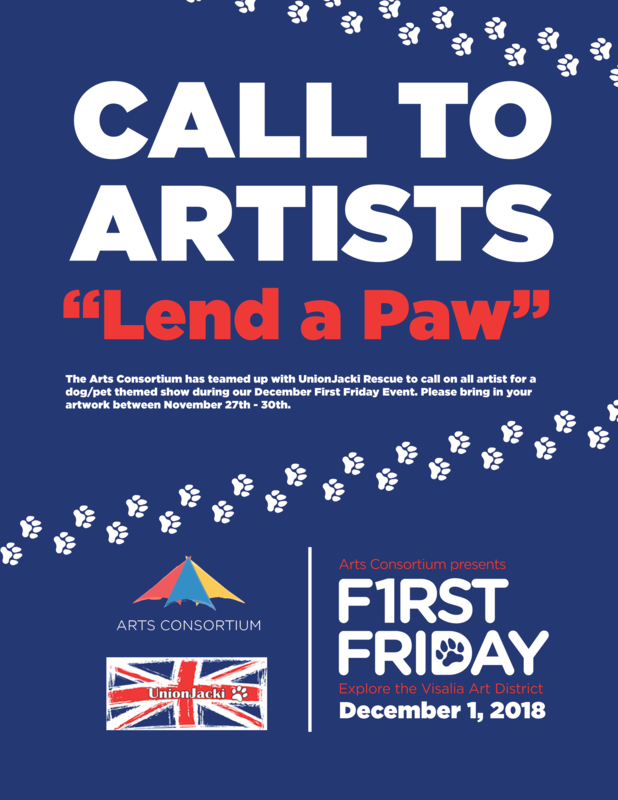 The Arts Consortium would like to invite members and POTENTIAL members to participate in our December 2018 “Lend a Paw” First Friday show. 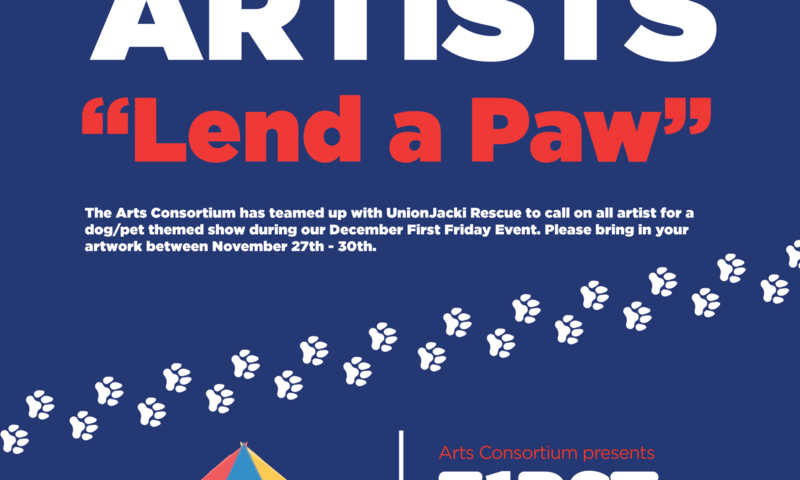 We have teamed up with UnionJacki Rescue for First Friday in December! We want to display your dog themed or Union Jack themed artwork…or maybe you have a piece with BOTH! UnionJacki Rescue is a 501(c)3 nonprofit. Jacquie’s journey started in the suburbs of Manchester, England with the family pooch named Laddie. She moved to Southern California in the early 80’s & began her career in pet grooming. During the event we will also have a dog adoption! Gift Baskets and other items will be auctioned off with proceeds going to UnionJackie! Artists we need your help to fill the Gallery! Each work of art should convey the theme. Of either dog(s), or British themed artwork. We will be asking for a $5.00 entry fee from Arts Consortium members and $10.00 from non-members. Per Piece. If you want to become a member at take in we will waive the fee when you pay the $25.00 membership. If your piece sells we will take 20% commission of the selling price. The Consortium will handle all sales. It is the artist’s responsibility to price their work to reflect the 20%. Work must be picked up by January 3rd.